A family member is having a baby in a few months which means baby shower time !!! When I am buying gifts, I shop for something useful but unique. I recently was introduced to Lil Baby Cakes . And when you hear cakes you might think food......but no Lil Baby Cakes are diaper cakes. Which make a great gift for a new baby or mom-to-be. Thanks to Lil Baby Cakes I had the opportunity to review their Satin Blue Frog 4-tier diaper cake. I was in amazement when it arrives. It was an absolutely beautiful! I have seen a couple of diaper cakes in person before, but nothing as nice as this one. It is wrapped in tulle and ribbon and is ready to be given as a gift ! I am having a hard time deciding if I am going to wrap it for the shower for them to open or have it on the table as a center piece. We keep a watchful eye on the latest fashion trends for babies, so your gift is always current, original, and unique! You’ll find we offer one of the largest selections of stylish yet unique diaper cakes, from powder soft baby pinks and blues to contemporary themes – and everything in between! We even offer custom designs for a truly unforgettable gift or baby shower centerpiece. 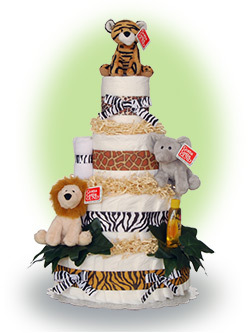 Our diaper cakes are designed and handcrafted with loving care, to the highest level of artistry AND quality. This meticulous attention to detail fused with artful creativity brings our Lil’ Baby Cakes alive with color, practicality and truly original designs. See for yourself! You can check out our most complete list of popular newborn diaper cake designs. If you a shopping and do not know the gender of the baby the also have cute diaper cakes that are gender neutral such as the adorable Welcome to the Jungle 4 Tier Diaper Cake . 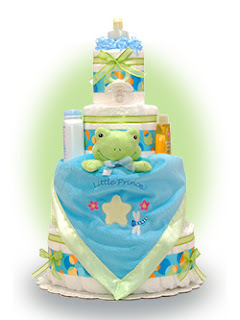 They even offer cloth diaper cakes for the moms that are more eco-conscious. Lil’ Baby Cakes have reasonable prices starting at $34 and up. There are many styles and price options (even custom designs) to accommodate your budget . This is solely the opinion of Life In A House Of Blue. Other people may have different experiences with the product.Thank you to Mom Made That & Lil Baby Cakes for providing a product to review. What an adorable cake Susan!! It comes with a lot of diapers too. Very cool! Great review!